I know it, I know it! Just like I said a while back, we're kinda getting a jump start on the Christmas holidays here but since it's a giveaway, I'm guessin' you'll forgive me. 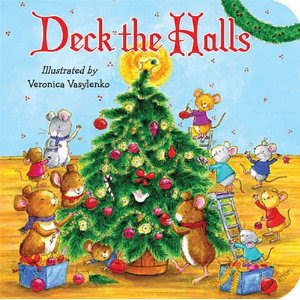 Furthermore, these two new titles,Deck the Halls and Jingle Bells both involve singing more than they do reading. Both contain the text of these well-known and very popular Christmas songs. The pages on these padded board books are consumed with mice celebrating good food, good friends and family, and good fun. They are singing, they are dancing, they are eating cookies and making merry in a way that only the best fictional mice can. Tiny stockings hung by the chimney with care and sparkling candle light makes me smile. Even though these books arrived well before Christmas, we've already sung them through a time or two. We LOVE Christmas singing books (and have I mentioned that I love picture book mice and sparkles and glitter?!) so these are a big hit in our house. We're also quite confident that they would be a hit in yours. As a blessing, Tiger Tales has offered a one set of these two books to one of my readers here at Reading to Know. To win? Simply leave a comment below. This contest is open to U.S. Residents only and will be open through Tuesday, November 15, 2011. (That way we can get things wrapped up and have the books to the winner in time to use this holiday season!) PLEASE LEAVE A VALID E-MAIL ADDRESS ALONG WITH YOUR COMMENT so that I can contact you if you win. Thank you, Tiger Tales, for providing more books for myself and one of my readers to enjoy! Enter me, please! :) These look precious! They look adorable and cheery and I can think of a few who would love them (they just asked me, "How many days until Christmas?"). Oh I would Absolutely LOVE to win these for my Daughter! I'm sure getting into the Christmas Spirit already and, like you, LOVE Christmas, Mice and Sparkles LOL. Perfect Combo! These Books look adorable! Mice haven't always been my friends--at least, not after one tried sleeping with me! But I've reconciled to the little varmints--and with a bit of singing thrown in, I might be able to downright like them. I'd love to be entered. I'd love to win this a s a gift to my granddaughter! I know she would love it! I would love to win and read these books to my grandson at Christmas, as he loves Christmas books! Fun books! I actually packed up the few Christmas books we have wtih the decorations last year. Looking forward to unpacking them when we decorate for M to enjoy. 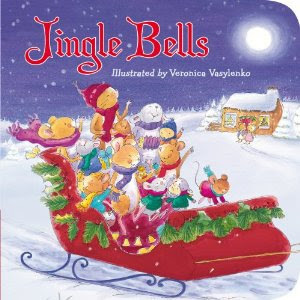 Can't wait to pull the Christmas books out! I would love to win this for my great nephew. Love to win these to add to my collection of loved children's Christmas books. These would be so fun to read to my nieces! I forgot to leave my email address!